Building upon having script output in emacs buffers, I want to display images as part of the scripts output. Having recently seen inline images in org-mode. or M-x iimage-mode. Now text that matches a regex in iimage-mode-image-regex-alist will be replaced with the actual image. By default this matches bare image filenames, and filenames within angle brackets (<>). Then we need to update images (which is not done on the fly) in a hook after compilation. The compilation-finish-functions appears to be the hook to use. "Only way I've found to refresh iimages (without also recentering)"
The call to clear-image-cache is to prevent the images being cached. I’ve been unable to find a way of just flushing the images used within a specific buffer. Calling iimage-mode with nil then t, disables then enables the minor-mode, causing it to refind all images within the buffer. 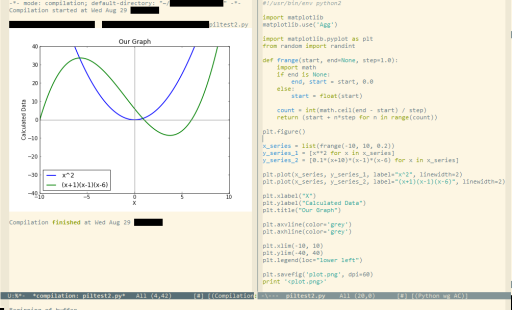 And of course, plotting using mathplotlib. Ideally some of this would be in a helper library.